I thought I’d get a good spot at the front of the arrivals gate, but instead I was fighting for real estate with tons of black-suited drivers and tour operators, picking up their guests. Finally, Phil came out of the gate and we didn’t want to waste any more time in the airport, so we headed out immediately for the saida (exit), and down to the Metro station. Luckily, I had already gotten Phil a loaded metro card ahead of time, because the lineup to get the cards at the airport metro station can get really long, but we got to go right in, and on our way to Oriente Station, where we’d be catching a train to Évora. The next available train didn’t leave for 3 hours, so we stuck our bags into a locker at Oriente station, and got a quick bite at the mall across the street. Since we still had a lot of time to waste, we walked down to the Oceanarium to check out the amazing aquarium on the outskirts of Lisbon. The Lisbon Oceanarium is a huge, multi-levelled square on the water, and all the floors wrap around a large central tank that houses a great variety of sea life – sharks, rays, sunfish, etc. It was great to be able to check that out instead of sitting around in the train station, but now it was time to go, so we headed back to the station and up to our platform…. 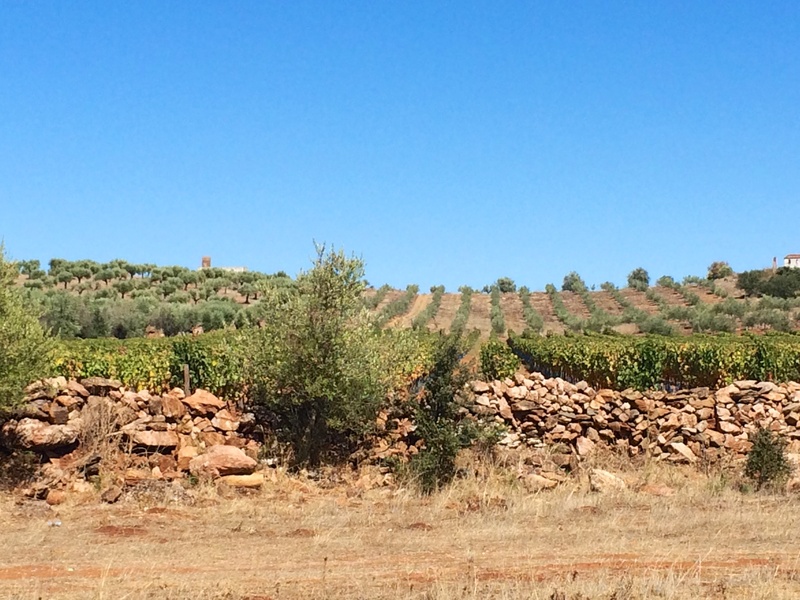 time to go explore Portugal’s agricultural heart of Alentejo. There’s something that’s just so energizing and liberating about the Alentejo landscape. The wide open countryside setting with rolling yellow plains, dotted with cork and holm oaks as far as the eye can see. Olive trees and grape vines add themselves to the mix, and the expansive blue skies that allow you to see far into the distant horizon. This is what you see as you make the train trip into the Alentejo province’s capital of Évora, but it all really comes to life when you get out of whatever vehicle you’re travelling in, and take some time to just stand outside and take in everything with all your senses. Photos of Alentejo landscapes are beautiful, but seeing it all in real life, and being there in the middle of it, is breath-taking. After Phil and I exit the train at Évora station, all excited to get going on our provincial adventure, we start getting into a cab to take us to the apartment we’ve rented, when a woman stops us. To our surprise, Maria, our host here in Évora, had come to pick us up at the station. That’s what I call amazing service! We get to the apartment, and Maria shows us around and gives us plenty of tips and guidance on her home city. The apartment is beautiful, and is much bigger than even what I’m living in at home! It’s basically like a small two-floor townhouse, with 1 1/2 baths, full kitchen, veranda space, living room, and 2 bedrooms. Only in Portugal, can you get such an amazing space for so cheap. By the time we got out to start exploring the town, everything was pretty much shut down. The fortified city almost felt like a ghost town expect for the strange contrast of young people (late teens/early 20s) running around the town. Why were there so many young people? Phil thought it was great, because they were around his age, and neither of us expected to see young people here. After we learned that there is a university here, it all made sense. 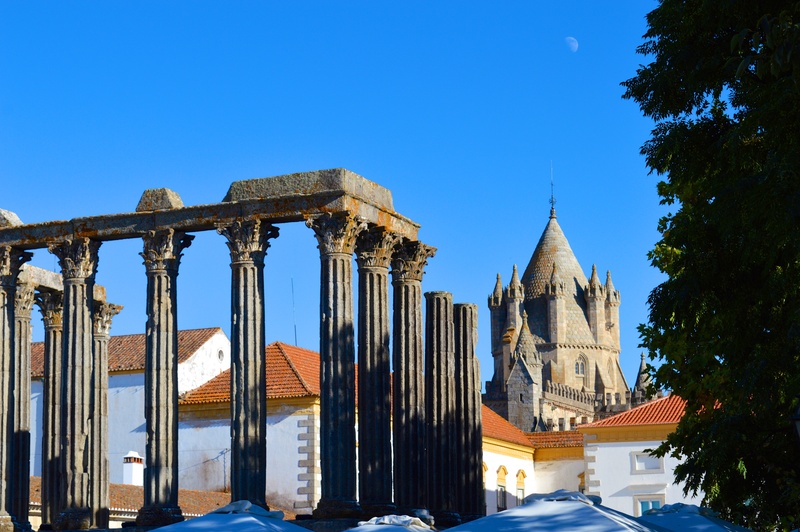 The University of Évora is the second oldest university in Portugal, being founded in 1559, and spending it’s early years operating as a Jesuit college. 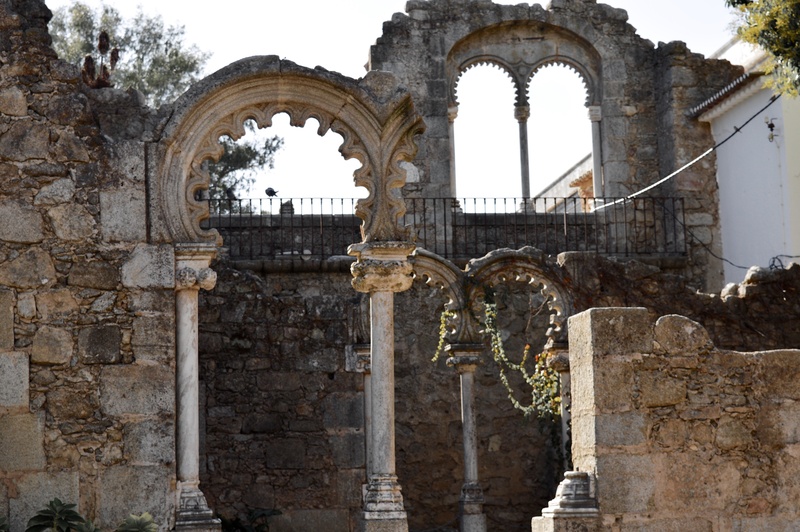 However, Évora’s existence is much older than it’s medieval fortified city walls suggest. In fact, the entire city is labeled as a World Unesco Heritage Site, because it’s historic centre inside the walls, is well preserved and so full of history from multiple periods dating back to Neolithic people who first settled in this region, as is evident by the many sites of megaliths, menhirs, and dolmens that are scattered the city’s countryside. The Celts were the first major group to settle in Evora, or as they then called it, “Ebora”. 57 AD is when the Julius Caesar of Rome conquered the city, fortifying it, and building many of the historical foundation that can still be seen today. One of the most striking monuments is the much in tact Templo da Diana, a well preserved Roman temple in the middle of the city, dating back to the 1st century, and thought to be a tribute to Rome’s first Emperor, and heir to Caesar, Emperor Augustus (born Octavian, and defeated Marc Antony). The Visigoths took the city after the fall of the Roman Empire, turning it into a “cathedral” city, and then the Moors took it from them in the 700s, and ruled it until the newly formed Portuguese kingdom reclaimed it under Christian rule in the medieval era. Due to us not knowing Évora at all, and the town shutting down so early, we had a difficult time finding a place for dinner the first night we were here. We ended up wandering the streets, starting from the north end of the city, and following the groups of students all the way down to the south end of town, where we eventually found Restaurant Sao Luis. This place has gotten some decent reviews online and from people we’ve spoken to in town so we figured it would be a good fit. This restaurant serves traditional regional foods, so we ended up ordering to reflect that. Phil had the lombinho do porco preto (black big pork loin steak), and I had the migas com porco (sort of a bread stuffing concoction, served with pork… migas is a very traditional Alentejo preparation). The food was alright, but nothing to scream about. It is what it is… just an traditional restaurant cooking traditional food. The next morning we woke up to walk out of town to get a rental car. 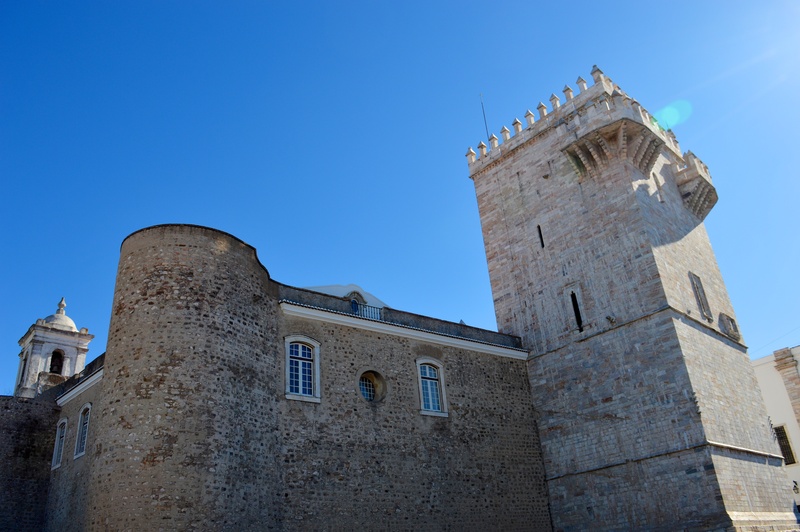 In our little Fiat rental, we drove north east of Évora, first stopping in the town of Estremoz, and heading straight uphill to the castle area. This vantage point offered beautiful views looking over the Alentejo plains, but what was most striking to us was the fact that so many of the buildings were made heavily with marble! Sidewalks, floor walkways, steps, window sill, foundation blocks, door frames, etc. All marble! 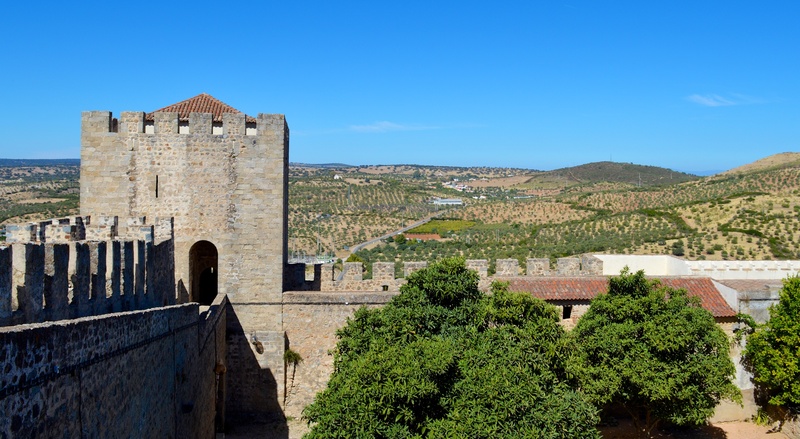 After leaving Estremoz, we continued driving out north west, almost reaching the Spanish border, and landing at the fortified hill town of Elvas, which was also has fortifications on either side of it, as this town was one a major defense against Spanish invasion. We wandered up and down the steep cobbled streets, visiting the main cathedral, the castle and it’s keep, and stopping for lunch at a low price, low quality tourist spot. Lunch was somewhat disappointing, but I guess we can’t complain when we paid only $15 for the both of us (which included dessert and drinks). Palace in Estremoz that’s been turned into a Pousada. The keep is all marble! Back in Évora for the afternoon, we decided to see more of the city before everything shut down again, as it was our last day in town. 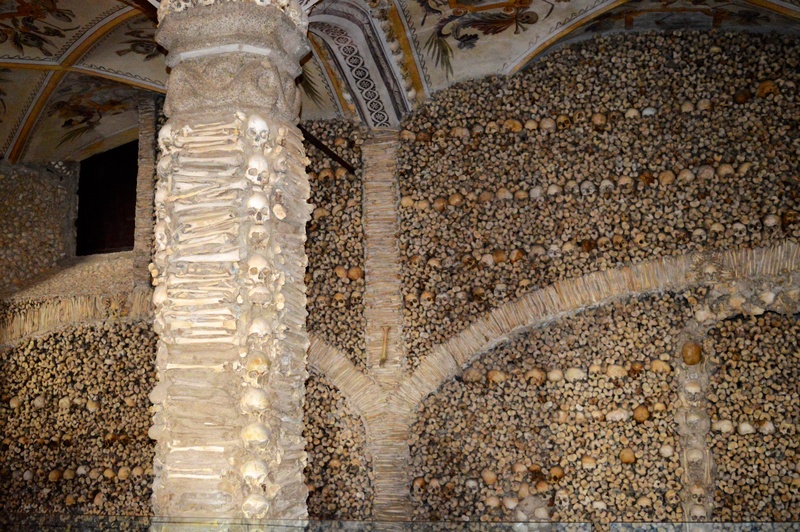 We headed to the Igreja Sao Fransisco to see the infamous Capela dos Ossos (Chapel of Bones). Hidden in an extension off the church, there is an entire chapel that is made entirely out of human bones. Skulls, leg bones, arm bones, you name it. The whole thing was wall to wall bones. Both creepy and intriguing, the message of the chapel read, “We bones are here, waiting for yours to arrive” (paraphrasing), a reminder of our mortality. 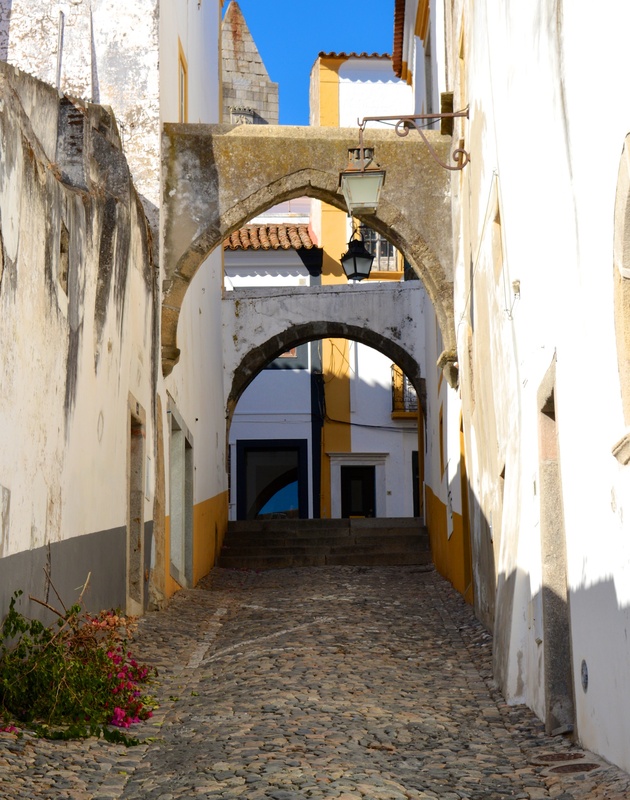 We wanted to end our stay in Évora with a good meal, so after a quick rest at home, we set out again, wandering the now empty streets, determined to find something. We happened upon Louro Tapas Bar, which was actually hidden in the back of a newer business/retail complex, amongst the old buildings streetside. It wasn’t too busy tonight, as it was a chilly night, but we had a good feeling. The food was fantastic. 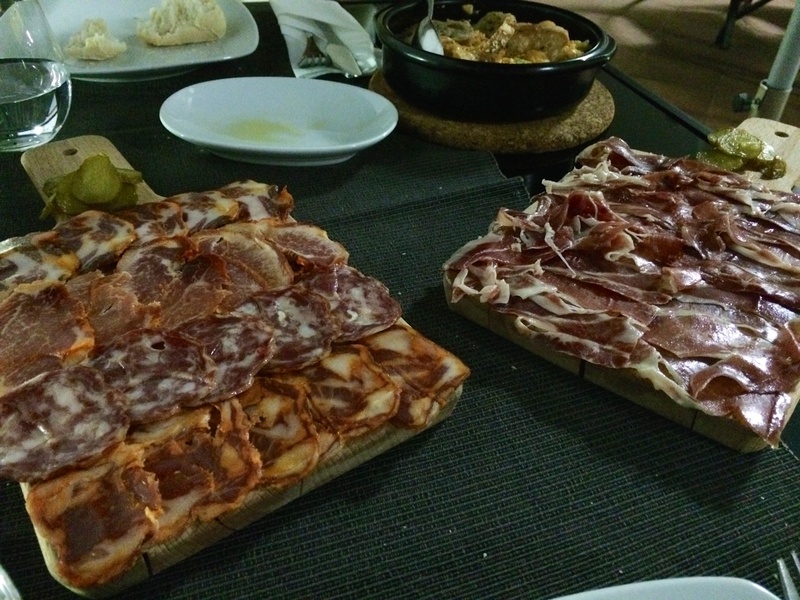 The best we’d eaten in Évora, and not even expensive at all! We had simple, yet refined tapas that included presunto, choriço, other cured meats, a sous-vide bacon dish, sous-vide tuna dish, a dish with silky smooth scrambled eggs and farinheira sausage, and an absolutely beautiful dessert or olive oil sponge cake with orange gelato. We ended up chatting for a long time with the chef/owner, Joao Louro, and become friends by the end of the night. He’s a really great guy, who puts out amazing food, and we made another culinary connection that no doubt, will come in handy in the future. It was a brilliant ending to our stay in this historic city. Tomorrow, we wake up early to go meet a black pig farmer and dig even deeper into Alentejan culture and gastronomy.